There was no way to cover all of what we experienced during our time in Ghana in my previous post, so I continue here. Time affords me deeper reflection, but not necessarily answers. We all know there’s poverty in the world. We see it our towns and cities where we walk past homeless people on the street. We observe mothers paying with food stamps at the grocery store. Perhaps some of us work or live in blighted areas. But let’s face it: for the vast majority of us, real poverty is a distant, faceless, nameless concept. Perhaps the most profound aspect of my time at Heritage Academy in Ghana was witnessing poverty at close range. Most of the children at Heritage eat their only full meals at school – a modest lunch of rice or stew is provided for them. Only children with a few pesewa (cedi coins) to spare can purchase the small snacks available at recess. Some rise long before the sun to do chores at home before they make the sometimes two-hour trip to school on a rickety bus (one with 15 seats but carries 30 children), and occasionally they don’t make it to school at all if the roads are washed out by the rains, or there is more work to be done at home. Sometimes they fall asleep in class because hunger and pre-dawn work make them tired. Some children have their lost their parents to simple illnesses and are moved around from one relative’s house to another, depending on who can afford to feed them. (The average annual income is about $400 per capita.) The reality of their lives is shocking, and they are the lucky ones. 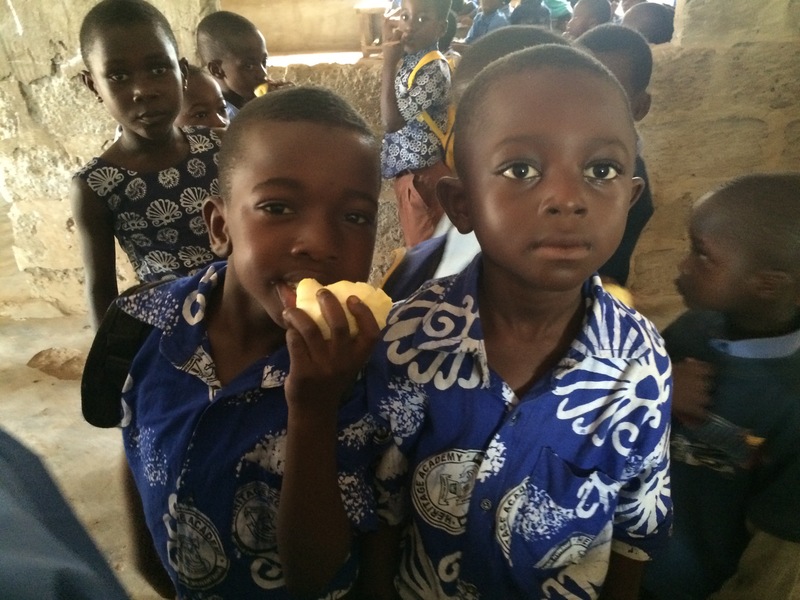 There are multitudes of children in Ghana who have no full meals at all, no tidy uniforms, and no education. Heritage Academy is a beacon of hope and a refuge for these children. One day, Kwesi Koomson, the founder of Heritage Academy and our host, brought a large clothing donation to the library and made a big pile of it where we were working. Word got out among the students and soon they were gathered at the library door clamoring to get in. He allowed them in one or two at a time to select one piece of clothing from the pile. They would pick through the pile and carefully select an item. Once back in the courtyard, they would squeal with glee and compare their new piece of clothing with their friends. Their one new piece of clothing. 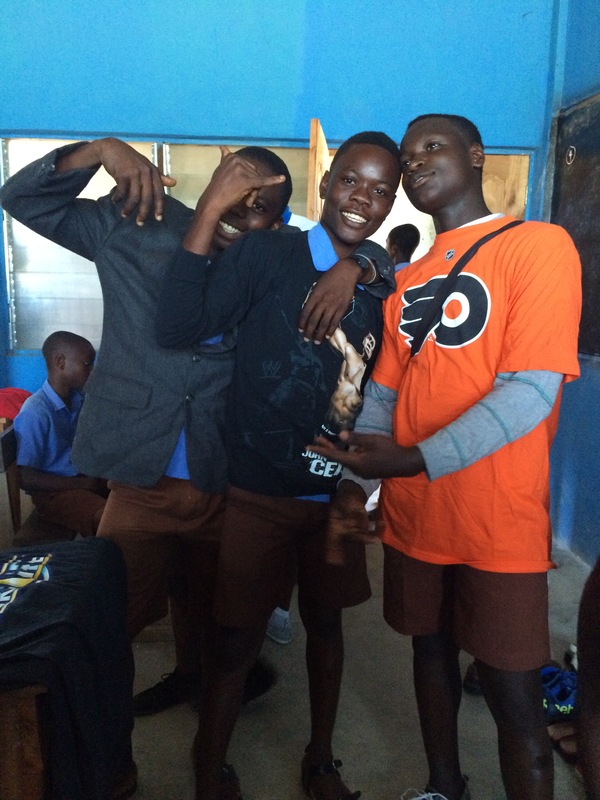 Some kids donned their new shirts right away and showed them off proudly, strutting around and mugging for my camera. A few days later, the scene was repeated, this time with shoes. We had hauled about 120 pairs of shoes with us that had been donated as part of a shoe drive in Westtown’s Lower School. 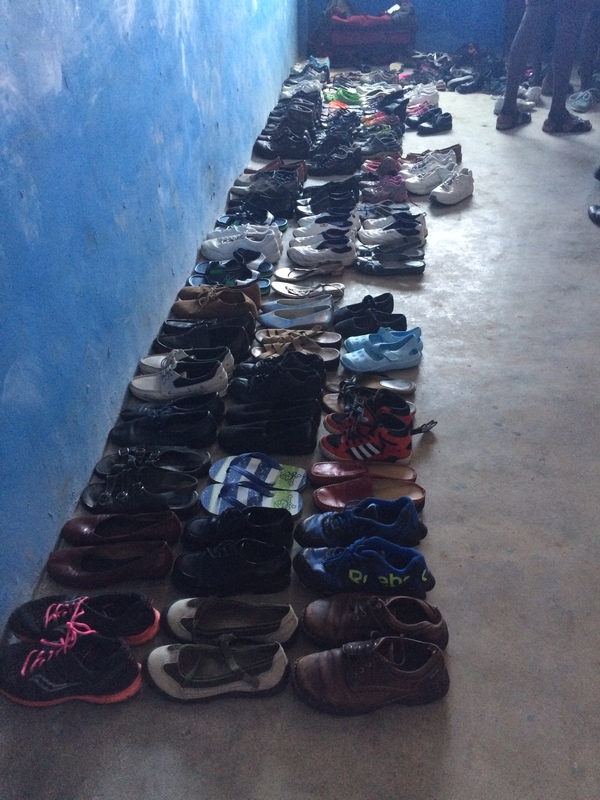 Kwesi laid out the shoes in a classroom and allowed a few students at a time to try on and select a pair of shoes. Once again, a large crowd of students clamored outside the door waiting for their turn to adorn their feet with new shoes. 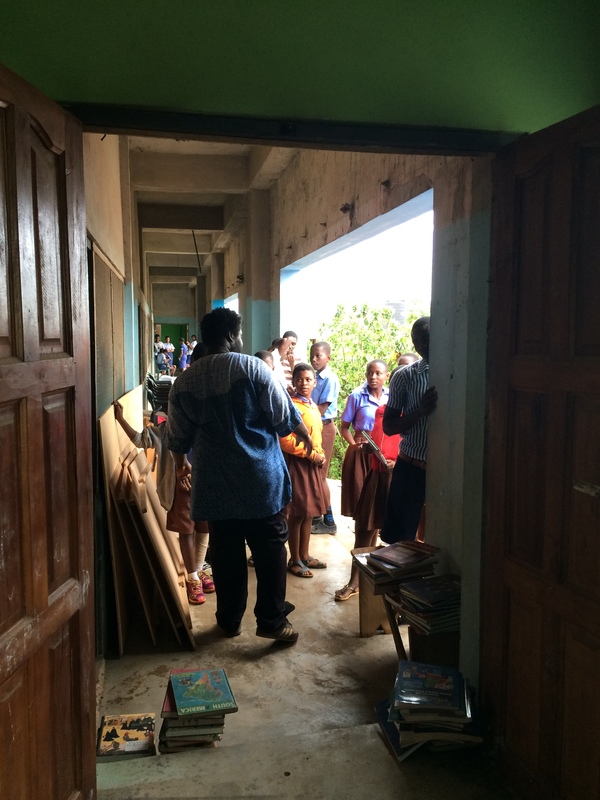 On that same day, Kwesi also distributed donated text books that wouldn’t fit in the library. Algebra. Calculus. English workbooks. American History. Kwesi would hold up a book. Who wants this one? and hands would shoot into the air. Me! Me! Yes, please! came their answers. They wanted books, any books, even if they were written in a language they didn’t completely understand about math or about a country whose history includes the enslavement of their people. These scenes are burned in memory and I will never again huff and roll my eyes at the selections in my closet, nor take for granted my access to books and knowledge. In fact, I will no longer take anything for granted. Yet perhaps more striking to me than what they didn’t have, was what they did: gumption, fortitude, and dedication to their education. In spite of their hunger and their need, they were so very alive, happy, hard-working, and grateful. It was something to behold. And then there were the others we encountered – the cooks, staff, and neighborhood visitors at our guest house in Ajumako. They were always there, but just beyond. Just beyond the dining room where our nightly buffet dinners were served. Just beyond the living room as we watched movies projected on the bare walls, sometimes peeking in through a door left ajar to watch. They stayed just beyond as the students played cards at night, only sometimes timidly accepting invitations to join in. They smiled a lot. They laughed at our antics. But they were removed. They served us food and hastily retreated. They cleaned up after us. They did our laundry by hand. There seemed to be a threshold they wouldn’t cross, and they lingered in the hallway outside of the small dining room where they chatted amongst themselves. Or, they hung out on the porch of the back house where the kitchen was or in the courtyard where they did our laundry during the day. I was fascinated (and saddened) by their reluctance to engage with us, even though they observed us with great interest. Sometimes I was sure I felt their longing to be closer. Several of us tried small talk which would only last a few moments. But we left it at that, for the most part, because this was how it was supposed to be, apparently. The distance of the staff was a striking difference from what we experienced when we were on campus at Heritage where the kids were desperate to interact with us. Add to that the fact that we came from Westtown School, founded on Quaker principles like equality and community. We have a Work Program wherein all students have jobs and participate in helping the community function – jobs like clearing plates, setting tables, and sweeping floors. We eschew hierarchy and titles; the students call teachers by their first names. So not only were we unaccustomed to being served in this way and leaving our dishes to be whisked away to be washed out of sight, but also we were unprepared to encounter people with whom we couldn’t just be together, as equals. I knew before we arrived in Ghana that we would grapple with the discomfort of being first-world visitors among third-world people. I even knew that we would encounter hierarchy within the Ghanaian culture because Kwesi had prepared us for it. He was part of it too, being the Lord of the Manor, as it were, as was his wife, Melissa – they were also attended to and served. But it was another thing altogether to see it in person. It added to the discomfort I already felt in being a person with too much everything by comparison. Although we weren’t accustomed to being served and had the urge to do our own dishes, we were told to let it be. Kwesi said, “I pay them to do these things, so you must let them work. They need to earn a living.” And that seemed to make sense, to honor their work and respect tradition. But I found it frustrating and uncomfortable. I wanted to know them more, and I think they wanted to know us more in spite of their distance. We all seemed to be actors in a play we had no part in writing. But I wanted to do my part and figured doing so might be a way into conversation, even friendship. So one day after dinner I carried some dirty dishes back to the kitchen. When the staff saw me coming with dishes they halted their chatter and jumped to attention, but were clearly confused. I asked where I should put the dishes, but a young girl quickly took them from me. I said, ‘Thank you. Dinner was wonderful!” She smiled and thanked me, but I could see on her face – on all their faces – that by bringing the dishes, I’d unwittingly communicated that they hadn’t acted fast enough, which was the opposite of my intent. I felt like a cultural bull in a china shop. It was a lesson for me, albeit one I didn’t want to learn. The niggling frustration that took seed in Ghana and has continued to grow since I’ve been home is what to do about the poverty we encountered. These particular children have an education and a daily meal which is a tremendous start, for sure. But what about the rest of their lives? How do they eat when they aren’t at school? What will they do when they graduate? Kwesi, who is kind and generous and worries about this as well, has hired Heritage graduates to teach. Some of our guest house staff were Heritage students and graduates. But he can’t hire them all. Those that want to go to college (and so many do) often find themselves in the same position their families were in when they were young: unable to afford the education. One of the house staff longs to become a pilot, yet he can’t afford flight school. So he’s a house hand instead, living on barely enough to get by. A young teaching assistant wants to go to college so that he can study business, hoping that he makes enough money to one day follow in Kwesi’s footsteps and help kids like himself get an education. But he cannot afford college. The Victorias, Robertas, Kofis and Emmanuels all have hopes, dreams, and ambition with little to help them come to fruition. I do not want to diminish the work and necessity of Heritage Academy. The education it provides is absolutely essential, as is the hope of something greater it gives its students. People who can read, write, speak English, and do math have far greater opportunities in their communities. There are success stories of graduates who get jobs befitting their education, and a select few that do go on to college (most often with the help of an “angel” donor). But for too many Ghanaians, their ultimate dreams remain just beyond their reach. So I began to feel that I was just beyond as well. Just beyond a solution to an overwhelming problem. Just beyond the means to help them in an authentic way. Just beyond understanding where to begin. If you would like to help a child get an education at Heritage Academy, consider giving to the Schoerke Foundation, which provides scholarships. Most of the children who attend Heritage do so at no cost thanks to donors. A $100 donation pays for one year of education for a child in need. This entry was posted in Uncategorized and tagged education, ghana, heritage academy, poverty, travel. Bookmark the permalink. I’m wiping the tears away as I type this. What a wonderful post! Aw, Jannykins! Thank you. I miss you!